Daphne and Phil ensure a very warm welcome with a relaxed, friendly atmosphere in our farmhouse home which dates back to 1780 but with all the modern day warmth, comfort and décor. 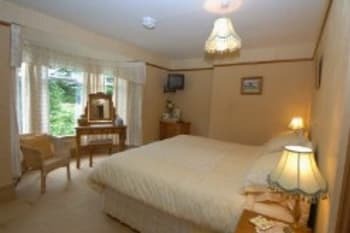 Our aim is to make your stay as enjoyable as possible and therefore pride ourselves on being helpful and informative We are an award winning accommodation in the Royal Forest of Dean, close to Symonds Yat and Forest cycle trails. Pets: Pets are allowed and can stay free of charge. Lovely B&B, with very friendly owners. We've stayed twice now and are planning to come again. Really can't fault it at all - Daphne is lovely! Very friendly and welcoming . Perfect location with scenic views . Breakfast was 10/10. Very friendly couple. Good local information. Very comfortable bed! Breakfasts generous and well cooked. Interesting old house. We had three meals at the Dog and Muffler - strongly recommended. Our dog was also welcomed. A delightful farmhouse in a delightful spot with sensational views . . . friendly husband and wife team, great breakfast. This is a working farm with a hundred Hereford somewhere in the distance . . . go there and you'll love it. English Bicknor is in the heart of the Forest of Dean, a thoroughly rural setting although Coleford is close by. 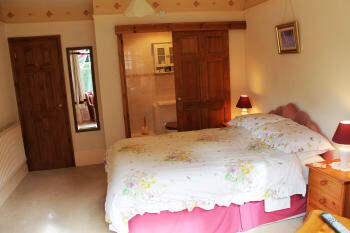 We received a warm welcome from Daphne.Me and my boyfriend stayed in a double room on the ground floor.The kids were in a twin room upstairs.Both rooms had their own s suite and were immaculate.The farm is set in some amazing grounds with lovely views.Breakfast was served in the conservatory which was lovely.Had a full English and there was also a selection of fruit and cereals.The breakfast was very tasty! Absolutely lovely friendly host, a beautiful location, so quiet and away from the chaos of the modern world. 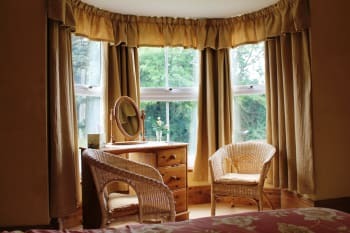 Clean with comfortable beds and a Breakfast to set you up for the whole day ahead. Plenty to do in and around the area. Lovely hosts and such a wonderful setting. Breakfast was excellent and very enjoyable looking out across the valley from the conservatory. 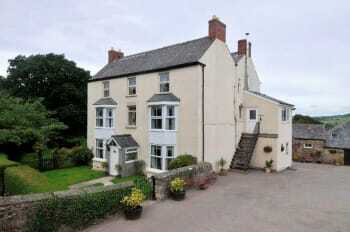 Excellent stay in a lovely period house. Very nice room, super breakfast. Very nice owners. Some rear rooms have a lovely view.